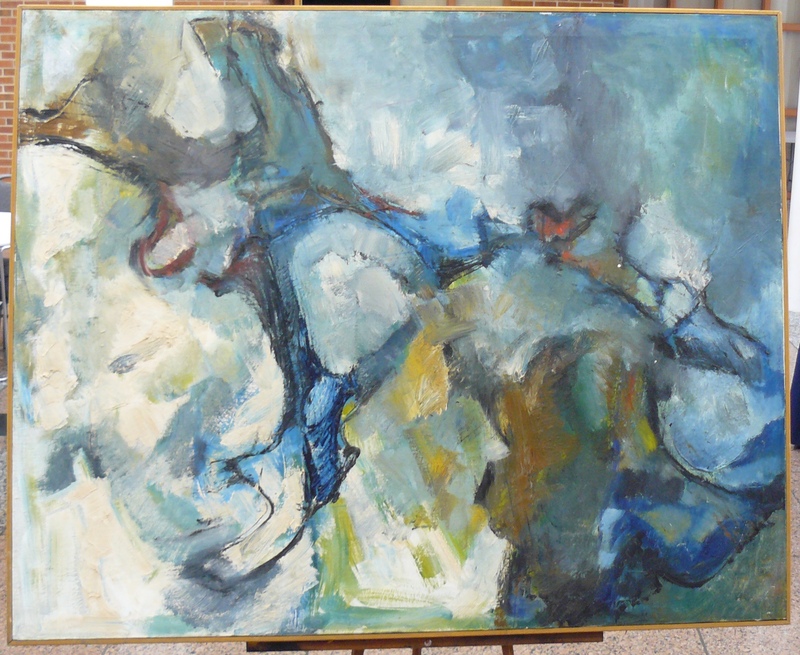 This large painting, which I call Blue Triumph, is part of the permanent collection at Clarke University. 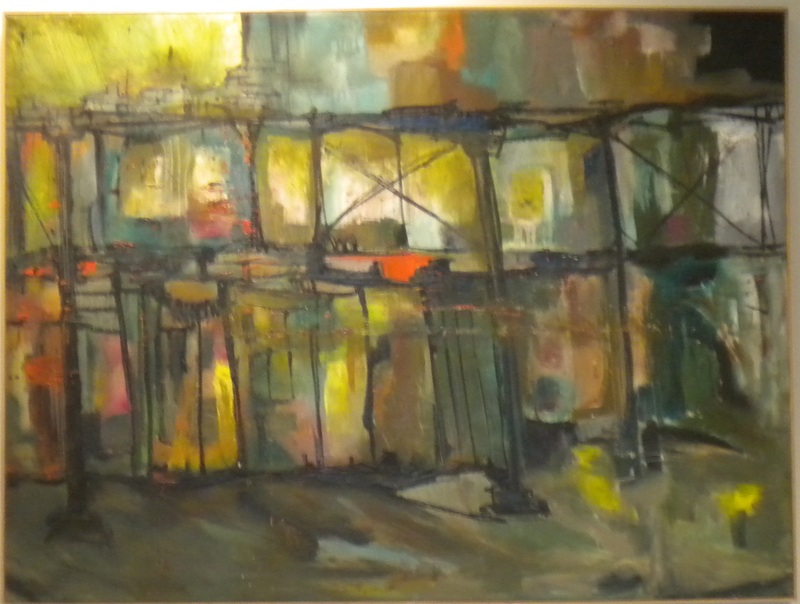 The date my aunt painted this is unknown, but it would be prior to her leaving to go to San Francisco in the late 60s. This could be late 1950s or early 1960s. My best guess is approximately 1966. I am not a world traveler! Does the large blue structure, center left, look familiar? This shape, which I associate with the modern Under Armor logo, appears in many of her paintings, but none as large as this one. I could be mistaken, but I see shades of suggestion that this represents the base of the Eiffel Tower. The perspective is a low to high vantage point. I’ve studied the painting a long time. I see a young girl in the bottom right, her tawny face in profile, mouth agape at she takes in the splendor of the structure. I see her wearing a blue beret that has slid onto the back of her head, almost touching the knapsack she straddles on her shoulders. This girl is a student tourist, perhaps one of my aunt’s students from Clarke. The sky is mottled with intensites of blue. Hints of green lawn tell me this is a spring or summer visit. An early morning or late afternoon sun bounces of the arch and bathes the sidewalk with sunlight. A red flag on the structure hovers directly above the girl’s forehead. 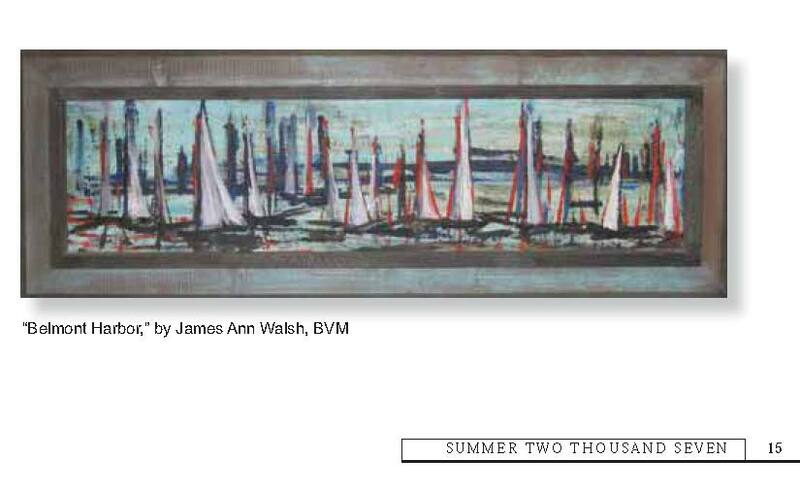 After searching my aunt’s name under different configurations, like “James Ann BVM” and “James Ann Walsh” to my delight, I came across an issue of SALT summer, 2007. On page 15 SMJAsaltsummer2007, my aunt was featured in a retrospective about the legacy BVM artists have left behind. She is also mentioned as being an important mentor to Ed Demers, on page 18. I was delighted. I also discovered a new painting, Belmont Harbor! I don’t have any information on the painting; how large it is, from what materials it was created or who owns it. All I have is this little scan of a PDF from a 5-year old magazine. 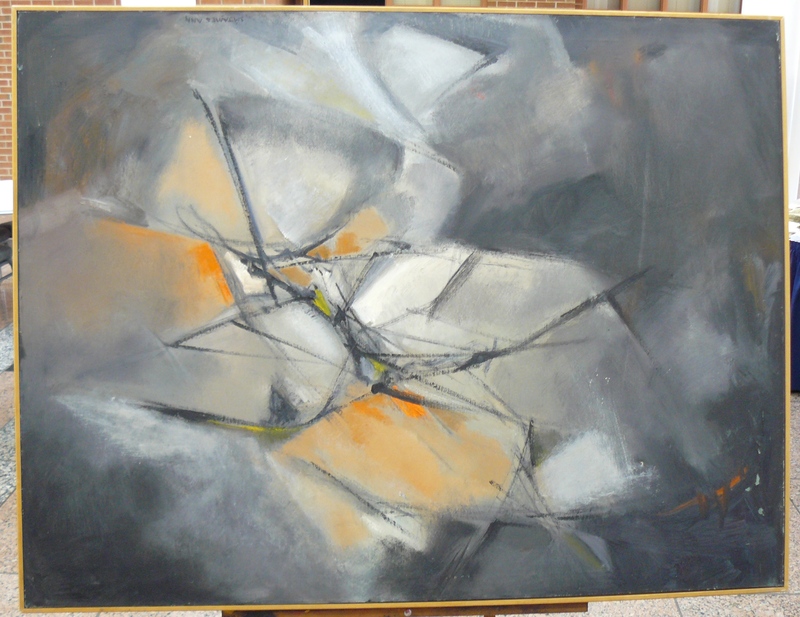 Under Missing Work, there is mention of “Regatta”, exhibited in 1957. I have a sneaking suspicion that what was a working exhibit title may have been renamed something else. Belmont Harbor is a regatta of sailboats. Could they be the same painting? 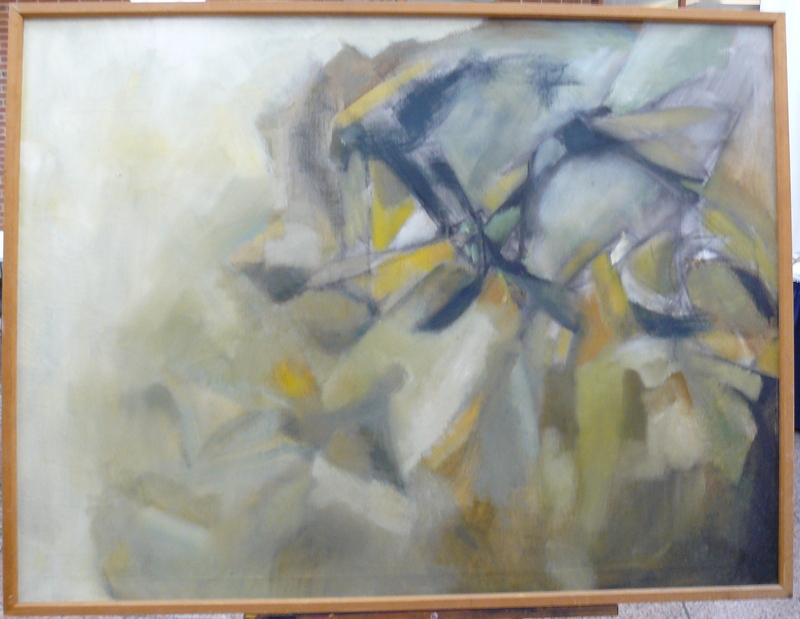 One of her students owns a piece called Gray Mountains, and Black Mountain is a missing work. I don’t know if these are revised titles or are completely different or similar theme paintings. My husband and I watched PBS’s Antiques Roadshow last night. It is one of our favorite programs, and as I was watching, this woman showed up with a picture of a canoe in the water. She didn’t like it, and neither did any of her family. It was inherited and it simply wasn’t her style. She thought it might have value however, so before she sold it she wanted to have an appraisal. It was a nice paintings, as paintings of canoes go, in my humble opinion. The appraiser, as I suspect a lot of them do, went to his colleagues, and probably the Internet. The artist wasn’t famous, but he had a following- and produced work that had its niche. It was a mid-20th century American work. 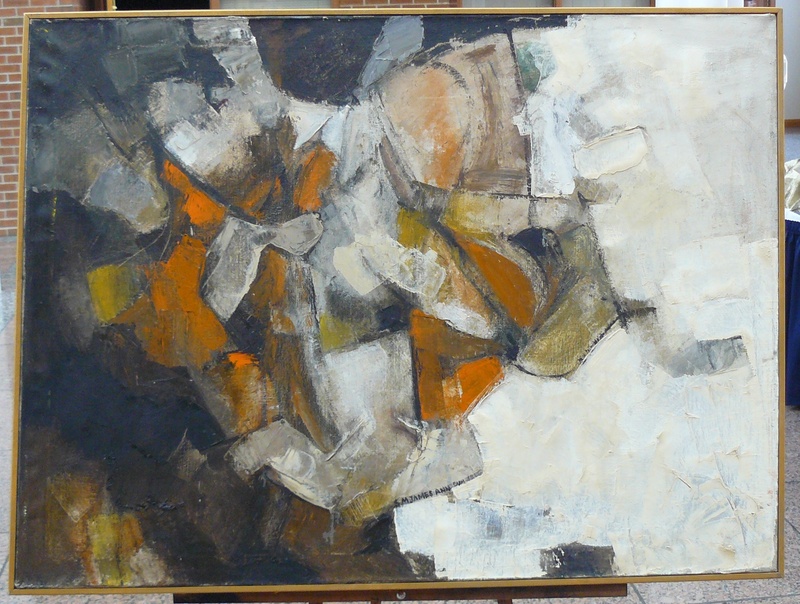 He was well known enough for a couple of pieces to have gone to auction in the past. This canoe number, wasn’t his best or his most creative, but the AR appraiser estimated, at auction would go for about $125,000. I think the family decided to like it just a little bit more after that experience! I have no delusions about the value of my aunt’s artistic oeuvre. First of all, I don’t own any pieces, and secondly, there was one teeny tiny mention of her on the Internet before this blog got started. My aunt may be relatively unknown, but not unappreciated! And that is my point. Someday, 50 years from now, if Antiques Roadshow or anything like it is beaming through someone’s information/entertainment portal, what would they say about one of her paintings? About Sister Mary James Ann? Some of her work I feel is brilliant. Art appreciation is subjective of course. Naturally, I am biased. But I will be honest and say some of it doesn’t move me, but I do have what I think is a good aesthetic eye. In the vernacular of the common man, some of this is very good stuff! What is called art, what people pay to hang on their wall, what appraisers see as worthy or not, is largely about personal taste. But worthiness in the art appraisal world also rests on an artist’s auction history, or what academia has written, or what museums choose to value or exhibit. I don’t know the first thing about art markets- but I do think markets can be cultivated, and not necessarily in a monetary sense, but rather, from an aesthetic perspective. Can one sense exist without the other? I don’t know. The value of an object is the price it will bring. I am not vain enough to think that this little blog is going to create a sensation in the art world, or that my finished thesis, as a published paper, book or documentary, could ever establish my aunt as a famous artist. That is not my objective. I would like those questioning faces to receive an informed answer. I worry that some day, someone will tote said painting to that AR appraiser, and he or she will scratch their heads and say, “I have no idea.” I worry my aunt’s work would be passed aside as an unknown entity. Dismissed. Dismissal appears to be linked directly to knowledge. Knowledge is good. How unfair it would be to have one of her paintings evaluated – unrecognized in the context of her entire output. That it might be assessed without consult or without the proper information? That would be sad. Maybe it wouldn’t bring anything in an auction, but I would want that appraiser to be able, at the very least, to educate its owner on the background and biography of the artist. That kind of appraisal would be beyond value! I called this Forgiveness because I see a figure kneeling in the middle of the painting, it’s hands outstretched and palms up. It faces a great white light and touches the light peripherally, as does one knee. Most of the figure remains in the natural world, with browns, dark golds and greens on the outside, and a heated red-orange closer to the figure. The red-orange may represent evil, or the fires of hell. This person is in the hotseat, in the middle of heated passion or turmoil. This figure has hope. Through prayer, he calls back the blessings and peace of a higher power. The goodness of God, his grace, his forgiveness is approaching and is moving toward the figure.There is some white in the center that could be the hand of God, ready to embrace the figure.